Surrender Monkey Friday! Hope…It’s All The Rage! 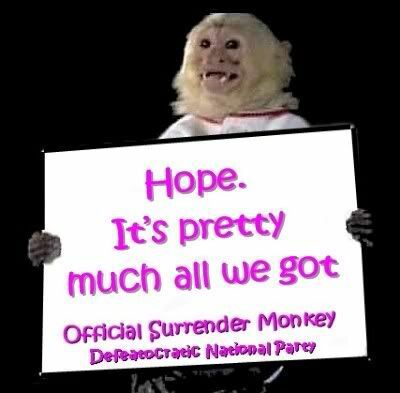 The Surrender Monkey is high on hope. But, what is hope? One definition is: the feeling that what is wanted can be had or that events will turn out for the best. Another could be: when you have no viable action plans, and no clue on how to implement you ideas, hope is what remains. Obama’s 45-minute speech touched on his trademark themes — hope and change — and many of those gathered said that is exactly why they are drawn to him. Having run on the idea of broad participation across society’s divisions, Mr. Obama’s campaign often seems to teeter on becoming a cult of personality — a feeling that the candidate and those around him do nothing to dispel. How soon till B. Hussein is tagged with a moniker such as “Dear Leader?” A search of Google News for “Obama hope” returns 19,000 hits. Yahoo News, 16,800. Obviously, not all involve B. Hussein’s standard talking point, but, you get the picture. Here’s an idea for the Libs. Next time your boss asks you how you are going to get something done, tell them “I’m not sure, but I have hope.” Let us know how that resulting rant turns out, OK? Cross posted at Pirate’s Cove, the official posting home of the Surrender Monkey.